Another great tool for Gush, and a reason to play green with Mentor. Interesting card. Mentor doesn't need more toys. ....in standard. It might even see small play in Modern, but the card is awful in Vintage. It's Green, so it stretches your mana base. It's a 3/2 do nothing ground creature that gets chumped by tokens. 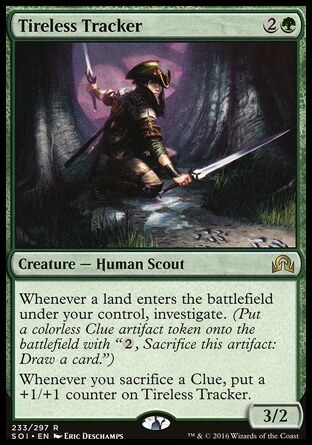 The only good thing it does is make clues, but that isn't good enough in Vintage. If it had a CC of 1, I would consider it (athough, I still don't think it would be playable at that cost). At a CC of 3 mana, the card is completely worthless. Unlike Mentor and Pyromancer, you need to use your fodder to bring the card into play. In this case, the fodder is Fetch Lands, where the other creatures mentioned, the fodder is spells. You don't have the same flexibility of playing your cards around this creature, you have to play your lands to do stuff before anything else. You cannot prioritize this cards ability to make clues. @gkraigher Well, that depends on your build. This card, while is not the best aggro option, creates permanents that can be translated into cards. Does not suffer from token hate and quickly goes over sulfur elemental. Every fetch does double effect. Vampiric and mystical improve with the clues. With fastbond in play it grows pretty quickly. That said, I don't think it's good enough while having access to 4 mentors and 4 gushes. But if you are going to the fastbond build, it's worth trying it. How is this better than Lotus cobra? I think it's Vintage playable but unlikely to see play in the short term. Is there some nutty control version of Shops that could use this and exploit the amount of permanents it spits into play with Smokestack and Tanglewire? This with Crucible of Worlds lets one set a Stack on two indefinitely. No. If you have all that stuff working for you already, you don't need this card. Conversely, if you have none of those cards online and just this card you will lose. Don't put yourself in lose-lose situations. @gkraigher I, in no way, think that this is going to see play in Vintage, but I just wanted to point out that there was a time where Gush decks did not think twice about playing White and only thought about playing Red for Sideboard cards. Things are different nowadays with the printing of Young Pyromancer and Monastery Mentor, as well as the restricting of Fastbond engine enablers (Brainstorm, Merchant Scroll, and Ponder), but once upon a time, people defaulted to BUG for their Gush colors (Gro-A-Tog). @gkraigher ... yeah. I'll come clean and confess. I was just trying to make conversation. I think this card is junk in Vintage. If you're casting this for three mana, why the heck aren't you casting Dack, or Metalworker, or Mentor? @wappla I know you played it in last night's daily. How did it turn out for you? @ChubbyRain It singlehandedly won the game the only time it got into play (I was playing one copy). It was also apparently good enough for Rich to Force. Tireless Tracker takes over the game in a different way than the rest of your deck, which is exactly what you want. You get clues for free. They cost neither a card nor mana, and then you draw a card whenever you don't have something better to do. If you have something better to do, even better. It allows you to optimize your mana efficiency. You can hold up mana and then draw cards on the opponent's end step. Furthermore, two mana to net a card is actually a good rate. You also never have to commit your mana to threats, because you already have one in play. Then you have good reason to keep play testing it. Certainly the clue aspect is pretty nice. Continue play testing and see what you think. As for the card draw - you mentioned running this in mentor. As always I have a question: what do you cut for it? Also, how is spending 2 mana to draw 1 card better than skull clamping a token which lets you spend 1 mana to draw 2 cards? Okay, but what was your record in the tournamnet? @gkraigher I lost a mirror to Rich and to Akash on Eldrazi and dropped. This is relevant why? In no particular order; the Vintage community values small sample size, confirmation bias, and an unwavering results based focus. @wappla Would you say this is the most efficient way to make clues? I think this is likely strongest when both players have been reduced to top decking, since then it is a clock as well as advantage off dead lands. I don't see too many vintage games going to attrition anymore though, because blue has just so very many recovery pieces. That being said it has synergy with Academy, Fastbond/zuran orb, and protection against tanglewire/smokestack. But considering you probably don't even want to play it unless you can land drop a fetch that turn, it seems very slow. Compared to Emeria Angel, Angel will probably close games faster by going over the top than this guy will in topdeck situations. And if we are looking at landfall strategies Return to Coralhelm and Knight of the reliquary can net you mana, make an arbitrarily large creature that will often start larger, and pull utility ETB lands out. While none are directly parallel, when you consider that both of those similar strategies didn't work out I'm not holding my breath too much for this guy who is just crazy mana dependent. Can someone tell me why you would use this card instead of Mentor? I mean we can run 4 copies of Monastery Mentor. Is this supposed to be Mentor #5+? Is this speculation for what creature takes over when Mentor inevitably gets restricted? Getting a Clue before this thing gets plowed hardly seems like it's enough justification to run this, especially when Mentor gets way more value than a Clue by the time it gets Plowed. Is this speculation for what creature takes over when Mentor inevitably gets printed?